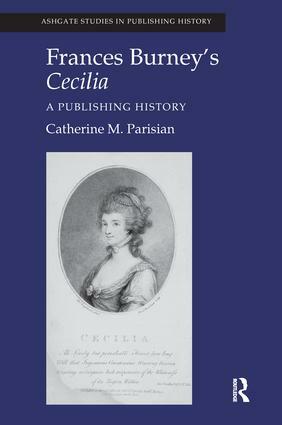 In her exhaustive publishing history of Frances Burney's Cecilia, Or Memoirs of an Heiress, Catherine Parisian mines an extensive archival record that includes portions of the original manuscript, annotated page proofs, legal records relative to its copyright, and an abundance of letters, to chronicle the novel's composition, printing, and publication from its first edition in 1782 to the present-day Oxford World's Classics paperback. Generally regarded on its publication as the most important novel since Tobias Smollett's Humphrey Clinker, Cecilia is a deft blend of the satire of Henry Fielding with the sentimentality of Samuel Richardson that brings a female perspective to the novel while perceptively probing class and gender relations in eighteenth-century British society. Parisian combines the methods of the book historian with those of the bibliographer to show how the two usefully inform one another and bear on the interpretation of the literary text. Examining 51 different editions of Cecilia, Parisian considers what these editions reveal about Cecilia's reading audiences and what insights these books provide into the printing and publishing trends of the past 200 years. Lavishly illustrated and accessibly written, her timely history demonstrates the importance of Cecilia to the art of the novel and the history of the book. "Parisian presents her extensive research with precision, using diagrams and tables to organize and clarify her findings. As such, this publishing history proves an essential resource for Burney scholars, as well as for bibliographers and book historians… Parisian’s Frances Burney’s "Cecilia" serves as a model for future publishing histories." Catherine Parisian, Assistant Professor in the Department of English and Theater at the University of North Carolina, Pembroke, USA, is a book historian and bibliographer. She compiled and edited The First White House Library: A History and Annotated Catalogue and has published a number of articles on bibliographical subjects.